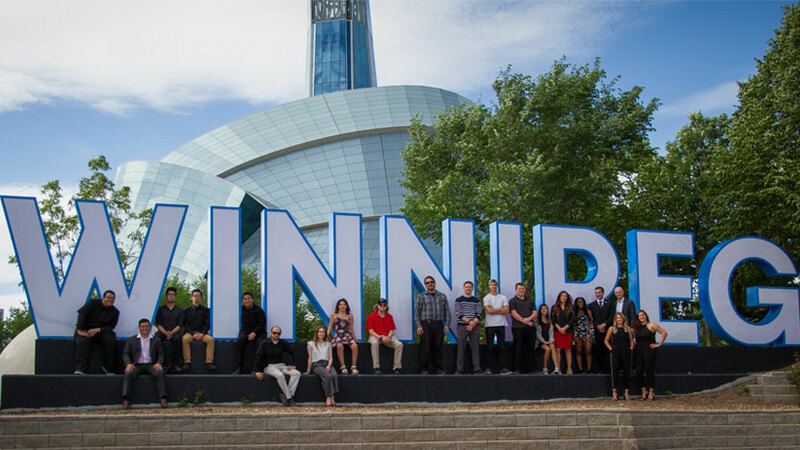 The 2017-18 season was a very exciting one for the Winnipeg Jets Hockey Academy (WJHA) as we celebrated the graduation of 12 student athletes who began their hockey journey in 2010-11 as part of the Lil Moose program. The graduation of these students was a special moment for the WJHA as they were the original group of students who travelled the path conceived and created by the True North Youth Foundation and partnering school divisions. Their graduation marks the start of an annual cycle of graduating WJHA student athletes and the realization of the WJHA’s goal of using hockey as the vehicle to help students graduate. Moving ahead, the number of annual WJHA high school grads will approach 50 per season by 2020. In order to celebrate this fantastic milestone, the WJHA planned a special night with the graduates. The night started off with all of the students getting picked up from school by a limo, donated by Tony’s Team Transport. Kierra had a great time acting as a DJ for the entire ride. The first stop was at the Forks for special photos and then to The Keg Steakhouse and Bar for appetizers and dinner. In attendance was TNYF board member John Olfert and his wife Brenda, Executive Director Dwayne Green, superintendents and teachers from both St. James and River East School Divisions. The highlight of the night occurred when WJHA Director, Murray Cobb, shared memories of each graduate and presented them with a Winnipeg Jets jersey that had been embroidered with the WJHA shield. It was certainly a night that most of the grads will remember! All 12 graduates worked extremely hard to get to the end of their high school career. From tutoring support to resume writing and practice interviews to simply being a friend with whom to share some of their frustrations, the WJHA is proud to have supported each student during their journey. Community partners and supporters have been the real heroes by removing participation barriers, being positive role models and letting the students know that the community is cheering them on.